Love + Toast is a Margot Elena Wells brand. If you shop in the US, chances are that you've seen one of her products somewhere — she's also responsible for Lollia, Tokyo Milk, Library of Flowers and Apotheke: M, brands which pretty much cover the price and distribution scale from Neiman Marcus to Walgreens. All of the lines feature scented products in whimsical packaging, although Love + Toast is easily the cutesiest of them all. It's geared a bit younger than its siblings, and has prices to match: many of the products can be had for $15 or less. Love + Toast emphasizes the use of natural materials (the brand's tag line is "natural, not neutral") but does not appear to make any "100% natural" claims. A portion of the brand's proceeds goes to Girls, Inc., "a nonprofit organization that focuses on giving confidence to girls." Jessica reviewed two of the hand creams back in 2010: Mandarin Tea and Pomme Poivre. Today, I'm reviewing seven items, including two of the brand's rollerball fragrances (Juniper Gin and Candied Citron), another hand cream (Sugar Grapefruit), three lip butters (Coconut Lime, Fizzy Ginger and Rose Sorbet) and a lip balm (Gin & Lime). Juniper Gin (shown above left) has notes of citrus zest, white floral, fresh cut greens and mineral salt. The opening is a pleasant green herbal citrus, crisp, heavy on the juniper but not so boozy as I expected. The dry down is flatter and woodier, and the white florals are extremely subtle — it's mostly a greenish herbal woody musk with a faint salty cast that grows in intensity as it warms on skin. It's rather soft, very clean (but not laundry-detergent-ish), and while it's not a powerhouse, it's reasonably long-lasting for the price. These are marketed to women, but a man could easily wear Juniper Gin — they don't make rollerballs for men, do they? are they un-masculine? — and it would make a perfect pick-me-up to slip into a gym bag or purse. Juniper Gin would be a nice alternative to a citrus cologne in hot summer weather, and might also layer nicely with citrus fragrances. Based on a quick spray of the Love+Toast Gin Blossom perfume, that one is sweeter, heavier on the floral notes, more feminine, and even less like gin. Candied Citron (above right) is sweet lime, white rum, sugarcane and aged oak. The opening is candied citrus, more sweet than tart, with a noticeable but pale rum note (it's boozier than Juniper Gin, at least for a time). As it dries down, much of the citrus fades, but the sugar and the "rum flavor" remains, layered over a warm, middling-dark, sort-of-oaky wood base. The lasting power is very good. It's not Lubin Idole or Serge Lutens Chêne, but I really liked Candied Citron; this one will definitely get some wear. Verdict: neither of these is likely to blow a perfumista's mind, but they're better, and more sophisticated, than I expected for the price. They'd make decent gifts or a good cheap thrill if your budget is tight, and while I'm not usually fond of rollerballs, the portability is an obvious plus. Sugar Grapefruit is a sweet orange with just a hint of grapefruit, mostly in the beginning, and a slightly floral undertone. It's cheerful and pleasant, but if you were hoping for lots of grapefruit, look elsewhere. The formula is reasonably moisturizing, but not so thick or rich as L'Occitane's shea hand creams, which do cost a few dollars more for a slightly smaller tube. And the scent is light: I complained about the fragrance level of the three L'Occitane creams I reviewed recently (Passionate Jasmine, Subtle Violet and Fleur d’Or & Acacia), but Sugar Grapefruit is even lighter; on the plus side, it won't interfere with whatever perfume you're wearing. If you have very dry hands, I would think it would be worth the extra $3 for the L'Occitane. Love + Toast Hand Cremes are $9 for 35 g. A quick glance at the hand creme testers at Whole Foods is all you will need to convince you to be careful with the metal tube: they do crack and split. Sugar Grapefruit is also sold in Perfume and Lip Balm. 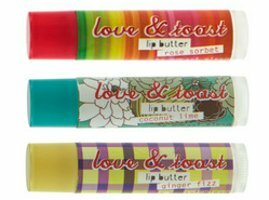 I really like the consistency of Love + Toast's lip butters, they're soft and smooth and have a nice slip. The main ingredients are olive oil, beeswax, jojoba and shea; there's also aloe and stevia, among other things. The butters leave a bit of a sheen on lips, but not so much that it looks (or feels) like you're wearing gloss. The formula is not thick or rich enough to be something you'd reach for when your lips were seriously chapped, or when you needed protection from the sort of cold winter weather we're having this year, but they're reasonably moisturizing for everyday wear otherwise. They might be great to slip into a summer beach bag, so long as you aren't looking for sun protection as well. I tried three flavors. Coconut Lime was my least favorite of all the Love + Toast products I tried; it's sort of vaguely like lime and coconut, but I found it to have an unpleasantly synthetic, almost plastic-y flavor, not at all like the bright & beachy sort of thing I imagined. The few reviews on Amazon are positive, so your mileage may vary. It's also true that the flavor/scent is hardly noticeable on lips after a few minutes have passed, so it did not annoy me for long. I liked Ginger Fizz better, although the name is a bit misleading; there's nothing fizzy about it (I was hoping for something like gingerale) and it's not even strongly ginger-y, although it does have a mild gingerbread-y sort of flavor. It's fine but I don't think I'd buy it again. Rose Sorbet is a fruity rosewater candy and was the only one of the three I tried that lived up to its name. 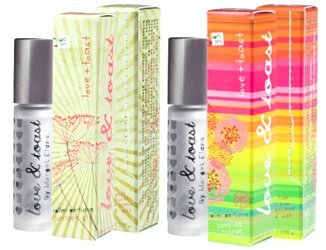 It was by far my favorite of all the Love + Toast lip products I tried, and the scent lasted longer on lips than the others. This one I will definitely buy again. The lip balms come in a tub (with an outer box) instead of a tube, and they cost more, although you do get a bit more product: they're 6 g for $9. They also come in different flavors than the butters, so unfortunately you can't just choose the kind of packaging you like best. I tried the Gin & Lime, and was surprised to discover that it's virtually identical to the lip butters in texture and wear, and in fact, a quick glance at the ingredients reveals they're the same. I liked the scent of the Gin & Lime — it's tart, with just a slight hint of juniper, and enough sweetness that it might more properly be called Gin & Limeade. And the packaging is cute, but there is nothing about this product that makes it worth $9. 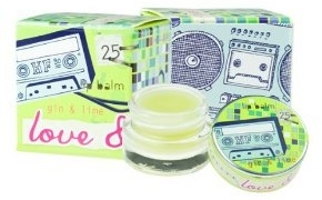 Unless you're really attached to the cute packaging or the idea of a glass tub, I'd stick with the lip butters. If this one was made in a $2.99 lip butter, I'd buy it again. Other lip balm flavors include Vanilla Chai, Star Anise, Prickly Pear, Lemon Mint and Cherry Lemonade. If you've tried any Love + Toast products, do comment! Love + Toast products can be found at selected Whole Foods stores, Ulta, Beautyhabit, Drugstore.com, Amazon, etc; they can also be found at discount if you shop around online. I really liked my first rollerball of Clementine Crush (mandarin, mango, vanilla sugar, and guava) … enough to drain it, but the second bottle smells different and not as good. The guava that was present in the first bottle is missing in this one. I like their Honey Coconut body mist. There was a sale on Love and Toast products on-line, so when I bought a new Clementine Crush, I bought Candied Citron, as well. I’m sorry to say that the Candied Citron smelled revolting to me — the oak note smelled strongly of vomit. I think that I was so horrified that I threw it away. Oh, too bad, guess they reformulated it? I just finished up a bottle of Clementine Crush body wash. It was quite thick and foamed extremely well for a natural-ish body wash. I found it at Marshalls for $2.99, so that was a win for sure. The packaging is so adorable, I got another scent as a gift for my sister-in-law (Dew Blossom?). When I looked online for the actual list prices, I decided I didn’t like it enough to buy again scent-wise, but am intrigued by the Honey Nectar scent. Now I am dying to try the Candied Citron rollerbal, but a little bit less due to previous comment! Vomit is not so appealing, eh? I think they have testers for these at Whole Foods, although a rollerball tester is a bit gross, I guess. Maybe you could roll the scent onto paper just to smell it. And good to know about the Body Wash. I smelled the orange-y Gud body wash out of the bottle recently & might have to buy that one, it was around $6 or $7 I think. GO ROBIN, GO ROBIN, GO! Good, I could use a cheerleader! Especially the lip balms and pots. I remember having the same curiosity for Pacifica – a brand that didn’t disappoint. Speaking of which, my husband has become addicted to the pacifica juniper solid perfume I recieved in a sample pack you drew quite some time ago – so thanks for that!!! Like Pacifica, this brand is pretty widely distributed, so you should have no trouble finding it here. No idea if either of those brands sells in other countries though. And so glad your husband loves the solid! Wish Pacifica would do some new scents, it’s been awhile.